Southeast Milan has a mix of residential and commercial areas. On the outskirts of the zone is the large Parco Forlanini. Still under construction, the Milano S. Giulia Project is taking shape on the grounds where petrochemical plants and a steel mill once stood. The British architect Sir Norman Foster is the designer behind this upcoming suburb, slated to be finished by 2011. Situated on the southeast outskirts of Milan, the area will be well-connected to rest of Milan by metro, railway, and motorway as well as the city's ring road. 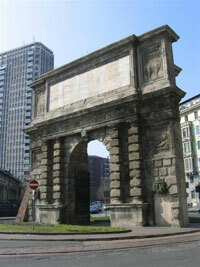 Porta Romana takes its name from a triumphal arch, originally built in the 16th century by the Spaniards as part of the city's fortifications. Most of the old Spanish walls have long vanished, and the Porta Romana of today is a fashionable residential district, elegantly laid out around small tree-lined squares, and close to the city centre. A growing number of boutiques, clubs, bars and restaurants have turned Porta Romana into a commercial hub to rival Corso Como and Navigli. The Policlinico hospital and the renowned Bocconi University add to the reputation of the district. Some splendid old buildings, such as Palazzo Acerbi, Palazzo Annoni and Casa Bettoni, are found along the Corso di Porta Romana that leads northwest into Centro Storico. British expats may feel at home in Porta Romana, as it is thought to have a vaguely London-like atmosphere.